KUCHING: St Joseph’s Secondary School Band will hold ‘An Evening at the Symphony’ at Trinity Methodist Church, 57 Ellis Road, on Dec 7 at 7.30pm. The St Joseph’s Secondary School Band concert band, percussion ensemble, jazz ensemble, and colour guard will join forces with the world-renowned T’ang Quartet (Singapore) – one of the most popular string quartets in the world. The T’ang enthralls and engages audiences with their consummate musicianship and tremendous charisma, and the audience will have the rare opportunity to see them in an intimate setting. “It is not often that such sophisticated artistry arrives on our doorstep right here in Kuching. We always hear them (St Joseph’s) performing so well overseas, so why not give the local community the opportunity to see their performances?” Old Josephian Association president Senator Datuk Dr Sim Kui Hian told the press yesterday. He said the concert band performs for the local community for one night in December each year as a way of giving back to the community. Sim pointed out that the band consist of very young musicians, who are very good and well-disciplined students. “Majority of them are from Form 1 and Form 2. It is good to nurture them from young to develop their talents. “When they finish Form 5, we are of course sad to see them leave but we know that we have produced young musicians and we hope when they are successful in future, they will come back to give back to the community,” he said. Band coordinator Jonathan Fox said this will be the fourth annual outreach concert for the Kuching community, which always features celebrated international guest artists such as T’ang Quartet. “They will be performing with our SJS concert band who have been working very hard. I have never met such hard-working and full of determination students,” he said. Band director June Ling said currently the band has 62 members and the number will increase in January when more Form 1 students come in. She said there is no special criteria for students to join as long as they are interested and able to show discipline and commitment. “Most of the students who join the band are not from very rich family backgrounds and no music lesson backgrounds. The fact that they are able to learn to play music from the start in school is really amazing,” she said. 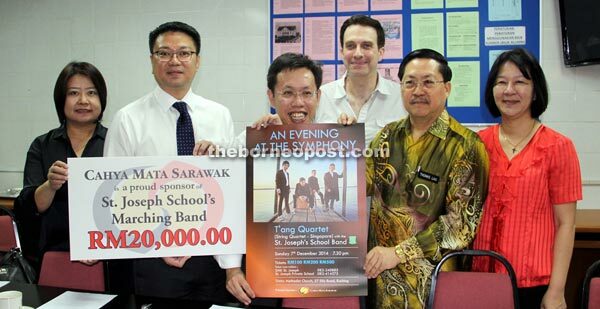 Cahya Mata Sarawak Berhad group general counsel David Ling later presented RM20,000 sponsorship from the group for the concert. Concert tickets are priced at RM100, RM200 and RM500. For details, call the school at 082-240885 or St Joseph’s Private School at 082-414575.